Are you looking to start a new career in Jefferson city? Do you want a job with benefits and the opportunity for raises? Luttrell Staffing Group is currently accepting applications for Inspector | Molding Operator | Spring Operator positions with Matsuo Industires! Click the link to apply and call (423) 586-5008 to schedule your interview TODAY! 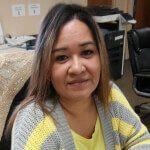 Louisa is a Staffing Coordinator for Luttrell Staffing Group-Morristown. Call her to find a great job!